To book your training and accommodation please fill in the Booking Form at tigermuaythai.com and we will get back to you as soon as possible and start the booking process. You can also prepay your stay using Pay Pal. You can also of course book through email or by phone using the booking number listed above. Any questions just send us and email to info@tigermuaythai.com or fill in the form below and we’ll get back to you as soon as possible. Tiger Muay Thai & MMA Phuket is located in the Chalong Area at 7/6 Moo 5 Soi Tad-ied. 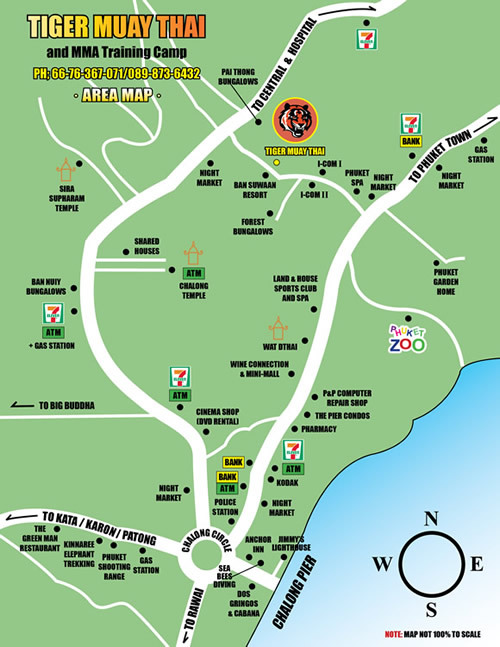 Take a look at our simplified map of the area or download the “taxi driver” card with a map and Thai writing. The blue little “pointer” is the location of the camp, use the map, zoom in and out and check out the island from an eye in the sky!